« Forget cat 5, Coax becomes the new buzz word! 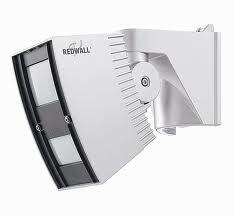 Optex is has announced that it is discontinuing some of its Redwall outdoor PIR detectors. This means that Optex has said it can fulfil orders only while current stock remains available. This will make way for the next generation of the Redwall external sensor called the Redwall SIP. The new SIP comes with a range of enhancements that allows more reliable external detection for the installer.New enhancements include. The new Redwall sensor can be installed even higher now. Up to 4 meters this gives an improved detection pattern. A view finder together with a sounder for walk testing helps to ensure a quick set up but with accurate results. By using a new Auto sensitivity adjustment. Changes in light and temperature can be taken into account to adjust smoothly to changes in the enviroment but not generating false alarms. The Redwall can now block out RF and white light. This is often the cause of false alarms in external PIR detection. Detection areas across pre-set cameras view can be tripped from multiple outputs. Detection directly underneath the detector. You will pay the same for the new Redwall series giving excellent value for money. So in summary the new Redwall SIP series of external PIR detectors will give the installer more flexibility and the ability to reduce false alarms in harsh environments and for no extra cost. This entry was posted on Monday, April 16th, 2012 at 21:00	and is filed under CCTV. You can follow any responses to this entry through the RSS 2.0 feed. Both comments and pings are currently closed.